One of the best historical biographers of our time writes about one of the greatest artists and scientists of our past. If you loved Isaacson’s biographies of Benjamin Franklin, Albert Einstein, and Steve Jobs, this is a must-listen. This is Egan’s first book since her Pulitzer Prize–winning novel A Visit From the Goon Squad in 2010, and it was worth the wait. Even before its release, it was longlisted for the National Book Award. 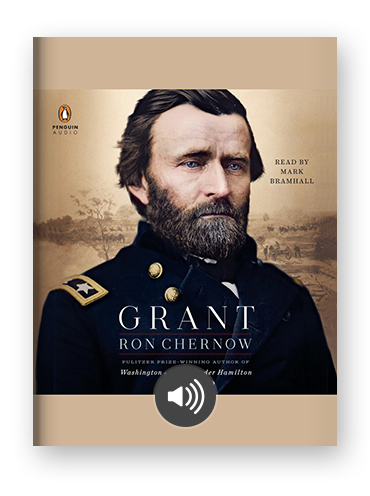 Putlitzer Prize–winning biographer Ron Chernow, of Alexander Hamilton fame, now takes on the American general Ulysses S. Grant in his latest. Between this and Walter Isaacson’s Leonardo da Vinci (mentioned above), October is something special for historical biography fans. John Green’s first book since his mega-hit The Fault in Our Stars is a deeply personal one, as it explores mental health issues that have plagued the author his whole life. An existential story rendered with Green’s signature mix of humor, history, and heartbreak. This book by bestselling coauthors–slash–brothers Chip and Dan Heath is filled with fascinating information and plenty of inspiration. Don't just seize the day — seize the moment. Beloved actor Tom Hanks proves he’s not only one the greatest on-screen talents in recent memory, he’s a supremely skilled writer, too. This collection contains seventeen whimsical stories, read by Hanks himself. If you enjoyed Yuknavitch’s TED Talk about being a misfit, or if you otherwise need reassurance that being a misfit is awesome, be sure to pick up her book. Yuknavitch has made quite a splash in the book world this year, with her novel The Book of Joan making a splash only a few months ago. Just as Nike’s swoosh symbol is one of the most recognizable symbols of excellence around the world, this memoir from the shoe company’s founder, Phil Knight, has quickly become one of the most-lauded, must-read business books of all time. Kaur’s first collection of poetry, Milk and Honey, has dominated the New York Times bestseller list for over a year, and now her second collection has skyrocketed straight to the top. It’s definitely time to read Kaur’s poems, whether you’ve been anxiously awaiting this collection or have never heard of her until now. A stirring and shocking story about how archivists in Timbuktu fought Al Qaeda by smuggling ancient texts out of the city and away from the terrorist’s destruction. Fans of White’s Bailey Weggins mystery series, rejoice — here’s the latest installment of the story, the first novel in the series since 2012. As an AOL co-founder, Steve Case made surfing the web part of our everyday lives and ushered in the “first wave” of the Internet. Learn about the first and second wave, and what the third wave will be in his provocative book. A timely debut novel about many countries’s refusal to accept Jewish refugees during World War II. For fans of All the Light We Cannot See.